Can you guess which these are? Can't wait to show you these babies! What's your favorite Fall polish? LOVE them! so excited for fall! Is that Zoya Faye? They all look great. I just ransacked a couple stores on my road trip to grab polishes I really don't need. 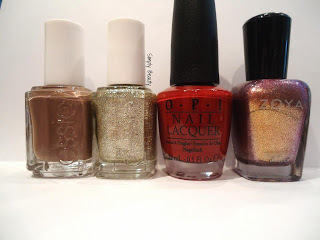 Haha I don't think any of them are fall but I'm trying to decide if an OPI LIquid Sands polish is worth it! Let's see it looks like you have Essie Mink Muffs, Essie Beyond Cozy, OPI First Date at the Golden gate, and Zoya Channing? They all look very autumnal.